It’s been some time since I wrote about earning miles with your utility company. There haven’t been any offers from utility providers except for a few from Energy Plus, but they get such terrible reviews that I decided to avoid mentioning them. Well here’s an offer from Reliant Energy, a company that several friends and family use, and I’m thinking about taking advantage of it myself. My old TXU plan expired and I’m currently paying $0.10805100 per kWh, so I can actually save money and earn 17,000 miles, or pay about the same and earn 27,000 miles. Either way I’m coming out ahead. Pricing varies and the offer isn’t available in all areas. Go here for complete details. Called Reliant and they told me the AAdvantage Miles is only offered for Texas. @ Barry Dean – I looked through the fine print and all it said was “not available in all areas”. Thanks for sharing the info! Good find, in my case their rate is just over a penny more per kilowatt hour then I have now, so over two years I would be out around $150, yes that is a good deal considering the miles but I am going to pass. I work for TXU and I’m also a customer. I’d hate to see you go as a customer but want to help you in your purchasing decision. When you quote electricity rates you also need to look at the number of kilowatt hours your home is using. Most electricity plans quote per 2,000 kwh. If you don’t use that much you are charged a higher rate. You save money when you use less, bottom line. 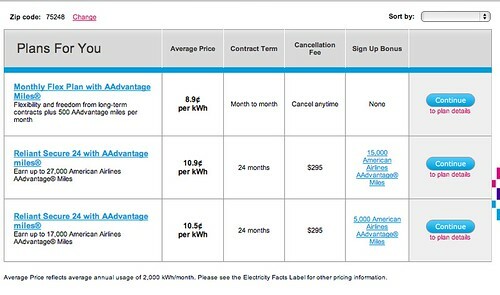 Reliant is a great company and for this plan I would check the EFL or Electricity Facts Label for not just the rate, but the rate at different usage levels along with other charges such as the TDU charges and base charges if any. If I were to choose a plan based upon saving money and convenience, (I am totally biased here) I would choose the TXU eSaver 6 plan. You can only sign up online and you are getting a rate of 7.9 cents at 2000 kwh and 9.4 cents at 1000 kwh when you sign up for autopay. It’s still a great deal even if you don’t opt for autopay. I was on Marketedge indexed month to month plan and average billing. I am willing to gamble on the price of natural gas which is why I am on this plan. Sometimes it’s a high rate and sometimes it’s a low rate, however, you can average out your rate over the course of a year. I make an autopayment every month of $150 and I don’t have a fluctuation) every month. I carry a credit balance on my electric bill at the end of each year. My usage is around 1500 Kwh. This is just how I budget. Even the Reliant Secure Advantage 6 plan seems like a better deal than the 24 plan. Also, you are committed to just a 6 month contract rather than a 2 year contract. That’s my two cents. I have to put the disclaimer that I am a TXU employee but my opinion is 100% my own.